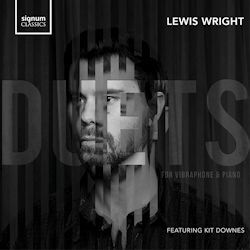 Vibes player Lewis Wright was nominated for the Downbeat International Critics Poll for Rising Star back in 2016. As a composer and drummer he is active across a variety of musical spheres – not least the band Empirical - but here, in his debut album he teams up with an old friend, pianist Kit Downes. The album lasts 33 minutes and features seven tracks. The sound quality is rich, warm, detailed and rounded and is excellently balanced. All compositions are by Wright. The two musicians interweave polyphonically with great technical dexterity but take care not to glide into each other’s lines. Fire and Flow shows that Downes’s rolling piano lines fuse finely with Wright’s weaving timbral patterns which are never allowed to overwhelm or to expand glutionously. One way the two generate interest is in matters of phrase lengths. Fortuna is a perfect example of this, with the pianist’s insistent but jagged phrases allowing Wright to overlay figures sonically, creating both a horizontal and vertical effect. They don’t ignore the pleasures of slower music either. An Absence of Heart is a lyrical ballad that encourages songful exchanges between the duo, whilst Ono No Komachi is a cool, limpid piece during which Downes evokes elements of Bop lexicon, ideas that are picked up by Wright. The exciting rhythmic exchanges on Tokyo ‘81 are accompanied by timbrally attractive unisons in generating a staunchly articulated dance, and it’s the waltz that seems to suffuse Sati with its lilting, yearning, romantic nostalgia. The disc ends with another amiably paced number called Kintamani, a sympathetic ballad. Wright’s musical influences apparently include Debussy and Bartók. Of the latter there’s barely a trace but some of the more diaphanous and lucid textures may evoke, even briefly, the French composer. But this is in no true sense some kind of crossover album, especially given the repertoire for vibes and piano is exiguous. It’s an album of many subtle, supple quiet pleasures.